Tomorrow, we're publishing a truly fascinating deep dive on the future of work for millennials. We'll cover how automation will impact careers, a new crop of jobs that are emerging for the middle class and how wages are faring. Tell your friends to sign up for Axios AM with this link so they can go deeper with us tomorrow, too. You can also share the link on Twitter or from your email. Situational awareness: Trump wants interest rates cut, the economy added 196,000 jobs last month, Michael Cohen's lawyers released new Trump allegations, a Japanese spaceship bombed an asteroid and Saudi Arabia threatened to stop using dollars in oil trading. 🚨USA Today: "Increased speed limits have killed nearly 37,000 people over the last 25 years, according to new research by the Insurance Institute for Highway Safety," USA Today reports. "The study concluded that a 5 mph increase in the speed limit causes an 8% increase in death rates on interstates and freeways. It causes a 3% increase in deaths on other roads." 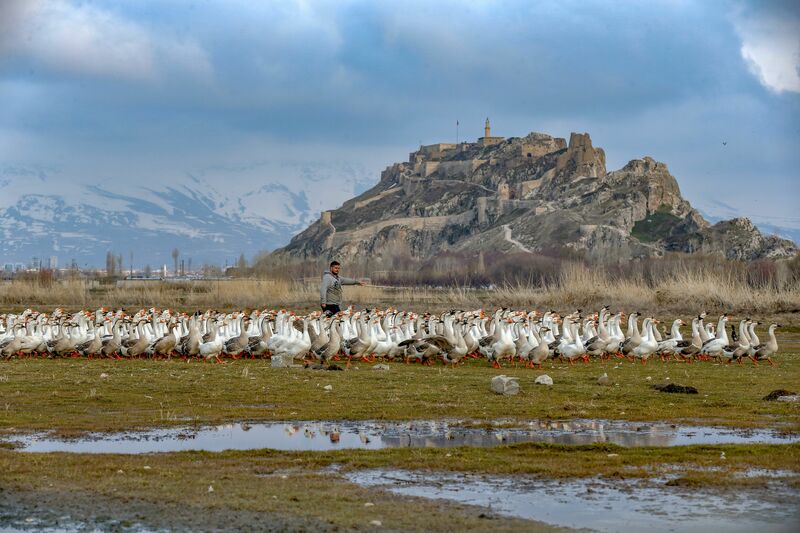 A flock of geese is tended to at a farm in Ipekyolu district of Turkey's eastern Van province. 3. 1 fun thing: Jordan Peele's "The Twilight Zone"
What to watch: Peele himself pops up as the deadpan narrator, just like Serling did at the beginning and end of each episode. Other players include Kumail Nanjiani, Tracy Morgan, Adam Scott, Sanaa Lathan, and Seth Rogen. Here's a spoiler-ific list of Easter eggs in the first two episodes.